During the summer my favorite cocktail is always a margarita and I love trying out different versions with every available fruit under the sun. Once cold weather hits I gravitate from the margs to other cocktails and the Moscow Mule is one of them. I’m not sure why; it’s still a cold beverage but I’m thinking it might be the ginger beer; it has some oomph to it that I love. 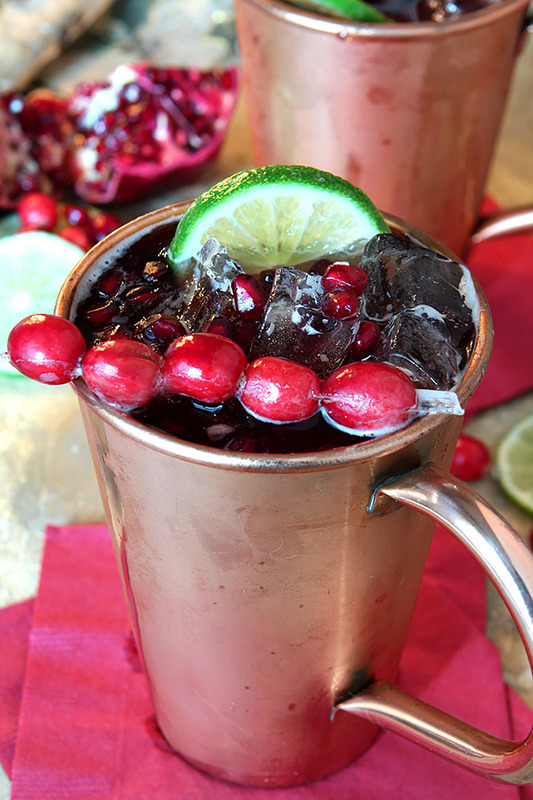 I’ve not experimented as much with Moscow Mules but I’m working it and this Cranberry Pomegranate Moscow Mule Cocktail was a worthy journey. 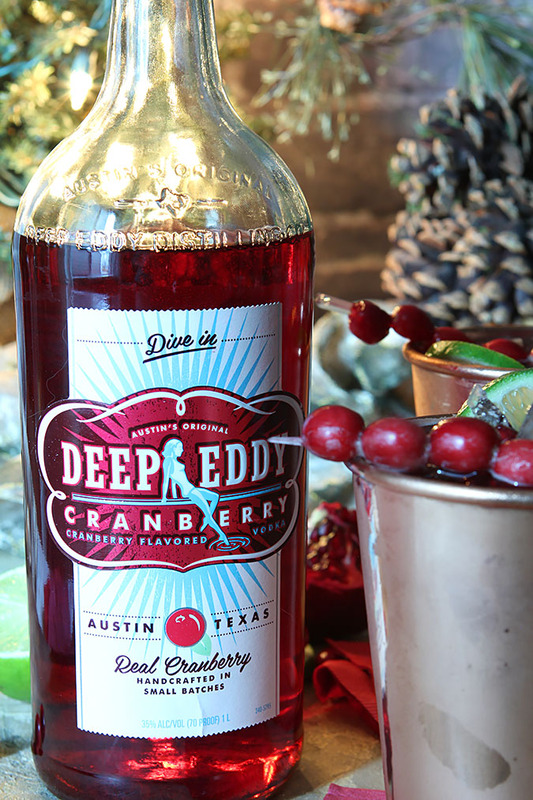 Fresh flavor for the holidays and that delightful zing from ginger beer. It’s a winner! So when I heard they had a Cranberry version I was excited to try it out. I love those little berries and their seasonal availability makes them that much more precious. 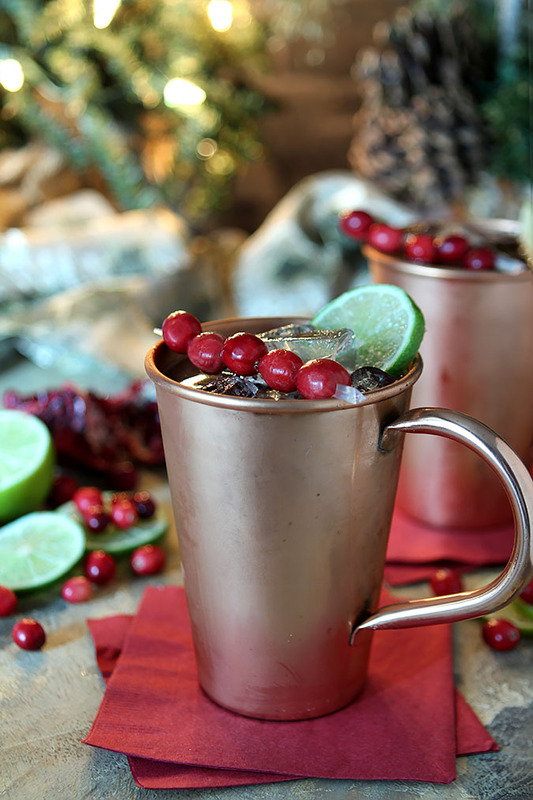 I’ve been wanting to make a holiday Moscow Mule and this was the perfect opportunity. I decided that a combination of pomegranate juice and cranberry vodka might be just the ticket and it was perfect. If you’ve never had a Moscow Mule you really need to change that; the vodka and fruit with lime and ginger beer is outstanding and as fun to make seasonal as my beloved margaritas. Never had cranberry vodka! Really like the idea, though — bet its flavor is festive. Color sure is! I’ll drink a margarita any time of the year, but I agree — it’s more a summer drink. This looks excellent — thanks! Both their lemon and cranberry are really good John…my neighbor and I sure love to share my drink creations but in a pinch we’re also good with them being added to some ice and a splash of soda…quick and dirty! Thinking the Mister might like this. Mules are his cocktail of choice. Pretty too!